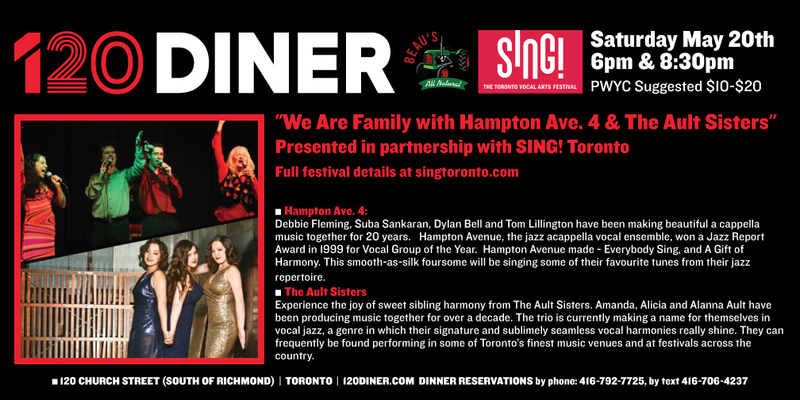 On May 20th, two of Toronto’s primo singing groups will add their voices to 2 separate shows at the 120 Diner. The Hampton Avenue 4, is made up of Debbie Fleming, Suba Sankaran, Dylan Bell and Thomas Lillington. Their style is a mish mash of styles, but swinging jazz standards are their forte. Debbie has written many of their arrangements and crafted original songs for the group. The Ault Sisters are Alana, Alicia and Amanda Ault. These women exhibit an incredible family vocal blend that only sisters can achieve. Their repertoire runs from songs of the 40s to contemporary songs, some of which they have composed themselves. Debbie Fleming arranged many of their songs. Both groups will be alternately singing their songs in the 2 shows presented – singing their own repertoire, and teaming up and performing a couple of songs together. The first show is from 6 – 7:30 pm, and the second show starts at 8:30 and goes ’til 10pm. The 120 Diner is a “cozy” venue, so it is advisable to reserve your seats soon by calling the number below. The cost is PWYC (Pay What You Can) with a suggested minimum of $10 – 20.